The teen driver who killed a 4-year-old girl and injured her grandmother while being chased by police on the Upper West Side was arraigned on manslaughter and vehicular manslaughter charges Wednesday. Seventeen-year-old Franklin Reyes, of Chelsea, was described by his defense attorney as a "good kid" enduring what he said was "the worst luck anyone could imagine." "The fact of the matter is, if he hadn't seen those lights flashing at him, he would not have bolted," Martin Schmukler told reporters after the arraignment. "Nothing like that ever happened in his life," he said. "He's not a violent kid." Police say a teen driving his parent's SUV without a license jumped the curb on an Upper West Side street while fleeing police, killing the girl and injuring her grandmother. Ida Siegal reports. Reyes was remanded back to jail after his court appearance. Family members refused to speak to reporters outside the courthouse. 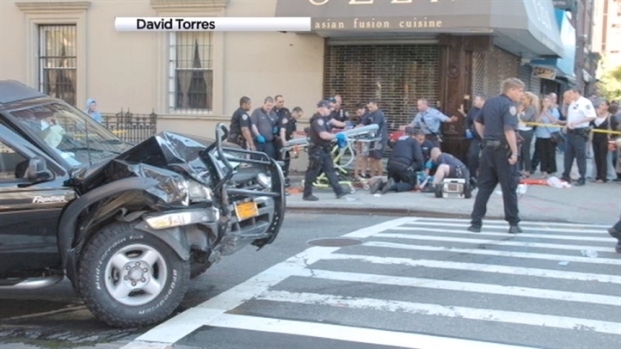 Earlier Wednesday, Police Commissioner Ray Kelly said Reyes was speeding when he crashed. Sources say he has told investigators he took his mother's car without permission to drive to school. Police pulled over Reyes near 87th Street and Amsterdam Avenue around 8:15 a.m. for making an illegal wide turn, but the teen -- who sources said had only a learner's permit -- drove off as the officers approached the vehicle. Police got back into their car and chased the teen, who made a turn on 97th Street and jumped the curb, pinning the 4-year-old girl, Ariel Russo, and her 58-year-old grandmother, Katia Gutierrez, according to the law enforcement official. Kelly said Wednesday that Reyes was going about 34 mph when he crashed and that 23 seconds elapsed between the time police got back into their car to follow him and the moment of impact. The speed limit in New York City is 30 mph. Kelly said the actions of the officers were reasonable. The child died at the hospital. The grandmother's condition was not known.